Next time you fire up the grill for burgers or steak, why not bake some bread, too? Baking on the grill is easier than you think. If you own a mixing bowl, spoon, pizza stone and baking sheet (round or square) sized to fit on your grill, you already possess all necessary equipment for outdoor baking. Focaccia is the easiest bread to bake, on or off the grill. Its relatively thin, flat shape allows for fast, even cooking using a grill’s somewhat uneven heating (which can make even browning of shaped loaves a bit tricky). 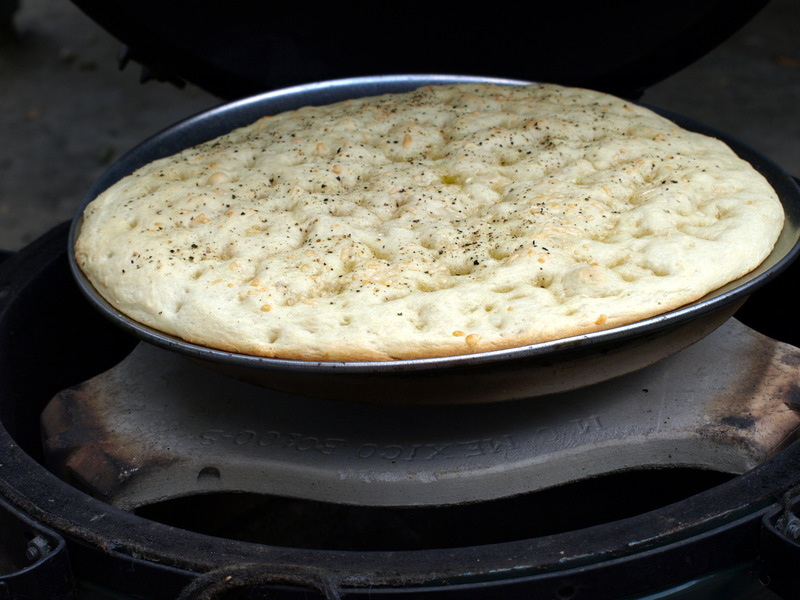 Though I baked the focaccia on a Big Green Egg, a gas grill works just as well—place a baking stone atop the grates and preheat for at least 30 minutes. 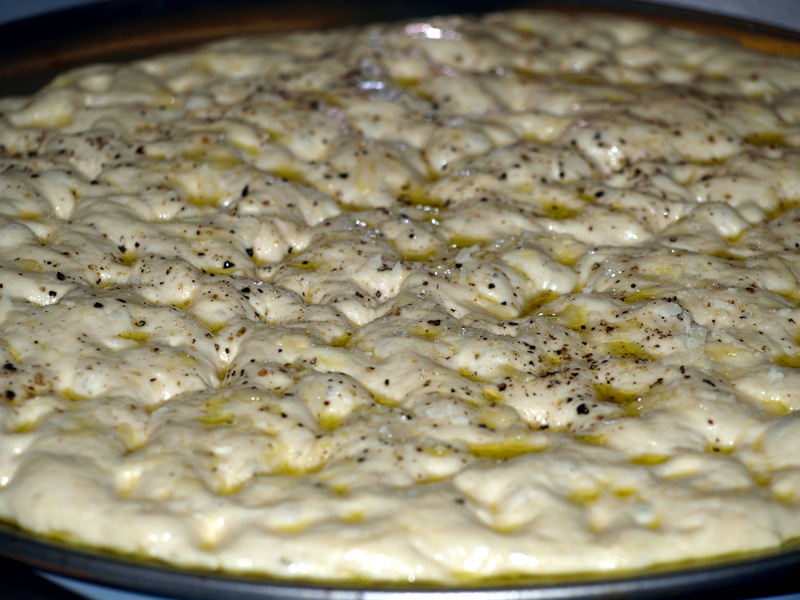 Due to the oil content, focaccia freezes nicely, so you might even want to make two at a time. Cut it into portions before freezing and defrost in a toaster oven for 15 minutes at 300 degrees. 1. In a large mixing bowl, stir together the water, yeast, and 3 T of the olive oil. Using a big mixing spoon, stir in the flour, continuing to mix until all flour is moistened. If using optional dried herbs, stir in now, along with the 2 tsp salt. Continue to stir vigorously for 1 minute (or 100 strokes). Cover bowl with plastic wrap; let rise at room temp for 1 hour. 2. Spread 2 T olive oil onto a pan that will fit onto the Egg. (I use a large aluminum round pizza sheet.) Use a rubber spatula or your hands to scrape the risen dough out of the bowl onto the oiled pan. With oiled fingertips using a “typewriter” or piano playing motion, press the dough from the center of the blob out to its edges, stretching the dough to (mostly) fill the pan. You want to deeply dimple the dough as you flatten it out a bit. If it resists, wait 10 minutes and try again. 3. Drizzle remaining 3 T olive oil over the dimpled dough. Sprinkle with coarse salt, optional black pepper & parmesan. Cover with oiled plastic wrap and allow to rise again until doubled, about 1 hour. 4. Light Egg & set up for indirect (use platesetter, legs down). Put spacers (Egg feet, pieces of copper tubing, or firebricks) atop the plate setter, then add the baking stone. Stabilize Egg at 450-500 and preheat for 45 minutes to 1 hour. 5. Uncover dough; bake at 450-500 for 25-35 minutes, until dark golden brown on bottom and lightly golden on top.